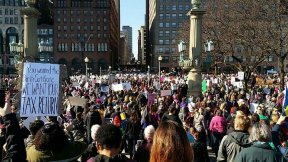 Women’s March Chicago’s January 20, 2018 “March to the Polls” announced its affiliation with March On, a national organization of womens’ marches and progressive organizations. The move is intended to amplify the group’s local actions in its focus on motivating women and their allies to get to the polls for the 2018 election. Similar actions are being planned by other women’s march organizers around the world, furthering the alignment and power of the movement. 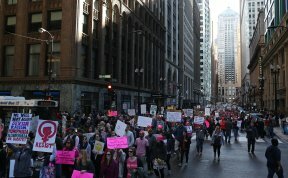 By joining forces with March On, Women’s March Chicago is better positioned to take more concrete, coordinated actions at the federal, state, and local levels to impact elections. Leaders of many of the women’s marches that occurred across the country on January 21, 2017 have also co-founded and joined with March On ahead of the one-year anniversary of the Women’s March. The goal of the new affiliation is to move our country in a better direction that leaves no woman behind. Millions of marchers strong, March On is uniting behind a sophisticated political strategy to take on both elections and priority issues. Women-led, but open to all, March On is putting its “marchroots” community at the center of major decisions, using cutting-edge civic technology platforms to forge consensus and crowdsource the types of candidates to support or oppose and which issues to prioritize. March On will be launching some strategic initiatives in the next year which Chicago organizers believe will be useful in organizing around common goals as women prepare to cast their ballots in 2018. For more information and to participate, volunteer, or donate, visit www.wearemarchon.org.